Last weekend the Middle Stump boys went westwards to sign copies of our book Cricket Banter. Having been the top selling cricket kindle on Amazon throughout the month of June, we went to promote the book, to do a signing and to meet a few of our followers on Twitter. What ensued was fifty odd hours of pure chaos! Having left Hertfordshire eventually around 10.30 on Friday, we hit the Welsh capital at mid afternoon on Friday. We were hoping to meet up with the Glamorgan lads who have been fans of The Middle Stump, but Gareth Rees fresh from a fantastic hundred in a four day game wasn't playing, and ex Glamorgan all rounder Ryan Watkins was working. So we went to the pub, as you do, and had a couple of pints called Cwrw, which is Welsh for beer. Pontcanna is a beautiful area of Cardiff, and full of media types. Legside Lizzy I think it was, tweeted recently that the walk to the old Sophia Gardens, through Bute Park is the most beautiful walk to a cricket ground ever, and she is not wrong. 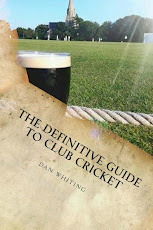 We sampled the Cricketers on Cathedral Road and the Cayo, a pub which we had recommended in our book. We now wished we hadn't after the miserable barman in there. After a few beers, including a chat with a very nice chap from Swansea and his missus we entered the SWALEC. I was quite impressed, especially with the air conditioned media centre although sad to say, I didn't see the legendary Ed Bevan in there. A huge crowd of just shy of 9000 fans were enjoying the sunshine, and there were groups of rugby boys everywhere, throwing beers down themselves as if it was going out of fashion. We were signing books at MGM Sports, which is the club shop of the SWALEC. The game itself was very one sided. In fact it was virtually over after twenty minutes, as Somerset were 15-3. The chances of coming back from that are slimmer than Posh Spice circa 1999! Glam bowled very well, and it was interesting to watch Dean Cosker bowl from side on, often bowling from 25/26 yards, which would vary his length and the flight no doubt. A canny bowler. Before the interval, in a lengthy queue for a libation I recognised one of our followers from Twitter standing behind us. Abby is a Glamorgan fanatic, and told us that her Christmas present is a Glamorgan membership most years, and what a nice lady she is. The passion and the fanaticism of the fans down there is worth a visit alone, and if they get a home quarter final in the T20, then some poor bastards will have to run the gauntlet of the beer fuelled crowd. They describe it as hwyl, which has no direct translation into English but it is a type of emotional fervour. Still, it is all good humoured and very funny at times. In response to Somerset's below par 125, Glam romped home in front of the partisan home support. A gentleman from the Valleys to our left seemed to delight in a misfield by Craig Meschede, reminding him that he had to pay to get over the Severn Bridge to do that! Chris Cooke made the massive boundaries look tiny as he flicked sixes regularly into the stand. Not many places have riot vans parked up and ambulances just waiting, I suppose to save people the bother of calling 999. I have also never seen so many tattoos in my life and that was just the women. The bars are packed, the Welsh women don't wear very much, and one young lady told me "I loves the London accent, me!". Whilst talking of fine Welsh hospitality, we would also like to thank the barman of O'Neills here for giving me change of £18.80 from a twenty pound note having bought two beers. A most kind gesture. After a kebab from chip alley otherwise known as Caroline Street, dripping in grease so much that you had to hold it away from the body so as not to get the gushing fat down ones shirt, and the attentions of a security guard for urinating into the River Taff after twelve pints, we finally walked back to our base for the night at the St Hilary's Hotel. If anyone is staying in Cardiff we would recommend it, especially the Black Pudding at breakfast! We went back into Cardiff the following morning after checking out of our abode for the night and watched the cricket in the Walkabout, where we saw Ian Bell complete his fine hundred, before heading over to Somerset in 30 degrees and it was seriously hot. On a day when two Army guys lost their lives up the road in the Brecon Beacons, you have to be careful. The Long Room at Taunton...scene of Jos Buttler's vandalism! Somerset was fantastic as usual and I had my first visit to a duck race. A duck race is a hundred plastic ducks which are bought for £1 a go and then plonked into a stream. The first one past the post three hundred yards away wins. Mine ended up caught on a rock, which is typical of my luck. The compere was a hunchback and comparisons to Gladstone Small kept us entertained, as we met up with Adam Burn from Backwell Flax Bourton CC. Adam played at our club for years back in North London before moving to the West Country, and is a great bloke. We stayed with my cousin Ruth on her farm in a lovely place called Winscombe on the Mendip hills. The following day we headed down to Taunton, and may I say everyone made us feel so welcome there. George Dobell, the senior correspondent of ESPN Cricinfo mentioned recently in his interview with us that it is one of his favourite places to visit, and he is not wrong. After signing in the club shop, we entered the Long Room which is a beautiful place to watch cricket from, with the view over the ground towards the churches. There is also a great painting of a young Vivian Richards in there at the County ground which is well worth a look. Taunton is a mish mash of characteristic enclosures and pavilions, all named after Somerset legends and the ground has amazing character. We were guests of Andy Nash, the Somerset chairman and speaking with him and ex Somerset player and now President, Roy Kerslake was an absolute pleasure. Both are very knowledgeable about the game, and the work that has gone on down there in recent years is a credit to Andy and the extremely hard working committee. Andy Caddick was perched to our left, looking resplendent in his chino shorts and everyone was enthralled by a fine game of cricket. Naturally when in Rome you do what the Romans do, so we had a Thatcher's Gold and discussed some very amusing stories with Andy and Roy, especially involving Steve Kirby. Two of the more amusing characters of the game were opening the bowling for each side in Kirbs and Jack Shantry, and we were hoping to meet up with Jack. We told him that if he sorted his unusual action out he would make a great bowler, and quick as a flash he texted Liam back with "But then I would be a 74mph throw down bowler"! Both of these have given us interviews and both are great characters of the game. Taunton was fantastic, almost full and as the cider started to flow, the noise of the crowd increased. Having watched most of my cricket in London it was great to see the provinces and the passion that these fans have for their club. Trescothick, Trego, and especially Jos Buttler are the darlings of the crowd down there. The Cidermen have created a side full of home grown talent and you can see that the supporters really identify with the local lads in the side. Buttler played an amazing straight drive for six off the back foot which broke a window to our left. In a very close game Worcester just pipped the hosts, and I was very impressed with Andre Russell for Worcester, who is massive. Our mate Shantry bowled well at the death too, although I was rooting for Somerset after the welcome we had received. On a different note, if anyone is down there get yourself a beef or pork bap from the Old Pavilion. Priced at £4 and a feast fit for a king, there are other advantages to watching cricket at a ground like Taunton, as opposed to feeling ripped off at Lord's or the Oval. After we had said our goodbyes, we headed back to North London and after 500 miles, twenty five pints, food of varying degrees and having met some fantastic, weird and wonderful people, we finally made it home. We would like to thank everyone at Glamorgan CCC and Somerset CCC for their fine hospitality, and can't wait until our next visit. Cricket is alive and well in the provinces and if you live around here and fancy some fine entertainment get yourself down to these grounds. We can guarantee that you won't be disappointed!